We nurses tend to spend most of our long shifts running around, and that can take its toll. In fact, our abused feet can end up looking downright atrocious. During the colder months, we’ve been able to slip on our socks and Crocs and hide our poor little piggies, but when it gets warm our toes are exposed in sandals and flip-flops (when we’re off-duty that is)! What to do? Spa visits are time consuming and expensive. And you’re certainly not going to open a makeshift spa in your hospital like these hospital staffers allegedly did. Instead, I recommend that after your next shift you go home, get your soak on, and give yourself a great DIY pedicure that’ll make your feet sparkle. I find it easiest to do this at-home pedicure in the bathroom so the faucet is close by for wetting and rinsing the towels. First, fill the basin with warm water and mix in the Epsom salt. This will help to soften your feet. Soak for about 10 minutes. Next, remove your feet from the water, and trim and file toenails to your liking. Apply a bit of the oil to the cuticles and work into cuticles while gently pushing them back. Soak feet again for about two minutes. Mix the remaining oil with the sugar until a nice exfoliator is created. Rub onto feet, concentrating on rough areas such as heels and calluses. You may also exfoliate your legs to get rid of any dry and damaged skin. Wet the two hand towels with hot water and wrap your exfoliated hands and feet entirely. Keep hot towels on until they are completely cooled. Remove towels while working off the remaining exfoliator. Apply the deep conditioning lotion of your choice to legs and feet. Remember to focus on the rough areas. Wipe any lotion from your nails so the polish will properly adhere, and you’re ready to paint! 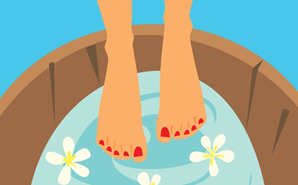 Be sure to use toe separators or cotton between the toes so the polish doesn’t rub from one toe onto the next.